A very low distortion high efficiency class-F power amplifier at 900 MHz. 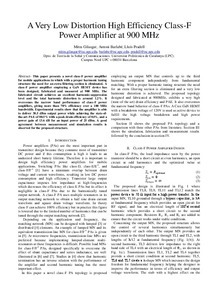 Gilasgar, M.; Barlabe, A.; Pradell, L.
This paper presents a novel class - F power amplifier for mobile applications in which with a proper harmonic tuning structure the need f or an extra fil tering section is eliminated . A class - F power a mplifier employing a GaN HEMT device has been designed, fabricated and measured at 900 MHz . The fabricated circuit achieves a n excel lent harmonic - suppression level and the t otal h armonic distortion is around 1.2% . It overcomes the narrow band performance of class - F power amplifier s, giving more than 70% efficiency over a 100 MHz bandwidth . Experimental results show that the amplifier is able to deliver 38.5 dBm output power while achieving the state - of - the - art PAE of 8 0.5 % with a peak drain eff iciency of 8 4 % , and a power gain of 13.6 dB for an input power of 25 dBm . A good agreement between measurement and simulation results is observed for the proposed structure. This paper presents a novel class-F power amplifier for mobile applications in which with a proper harmonic tuning structure the need for an extra filtering section is eliminated. A class-F power amplifier employing a GaN HEMT device has been designed, fabricated and measured at 900 MHz. The fabricated circuit achieves an excellent harmonic-suppression level and the total harmonic distortion is around 1.2%. It overcomes the narrow band performance of class-F power amplifiers, giving more than 70% efficiency over a 100 MHz bandwidth. Experimental results show that the amplifier is able to deliver 38.5 dBm output power while achieving the state-of-the-art PAE of 80.5% with a peak drain efficiency of 84%, and a power gain of 13.6 dB for an input power of 25 dBm. A good agreement between measurement and simulation results is observed for the proposed structure. Gilasgar, M.; Barlabe, A.; Pradell, L. A very low distortion high efficiency class-F power amplifier at 900 MHz.. A: Simposium Nacional de la Unión Científica Internacional de Radio. "XXVIII Simposium Nacional de la Unión Científica Internacional de Radio : URSI 2013 : Comunicaciones". Santiago de Compostela: 2013.